It seems a lifetime ago I got my first Android smart phone the DEXT and it has served me well, but over the years its has got more unreliable at holding a charge all day. To the point I could find it with not enough juice to turn on and tell me it had run out of juice. When it came to backing up the data for the last time some of the files were corrupt. A friend told me about the Moto G and how it was getting high marks in all reviews and it was only £135, so I started looking into it. Amazon seemed to be having problems getting hold of it at the RRP and the all the major phone providers were only offering it on contract. 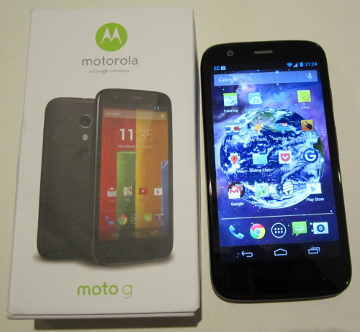 But I did find a "Where to get" link on Motorola's site that lead to a single "Buy it now". If it had not been for the direct link from Motorola I would have never of visited let alone bought from a site with that URL. The purchase process was painless and I got the phone delivered in a couple of days, and Parcel Force was holding it for one of those. The box it arrives in is tiny, millimetres wider/longer than the phone and only 3.5x taller. This is because the phone comes with no charger only a standard USB cable. For me, this was good thing I have plenty of mains to USB socket chargers lying around. If it was a problem for a customer such a device is under £5 from numerous sources. The first hurdle was adding a SIM card as it takes Micro SIM and mine DEXT one was a standard size. Luckily the SIM was marked with cutting points and with many online guides to choose from I managed to trim it down to fit. Worrying the card I created seemed to small and had some movement, but the tolerances must be high as I have never had a moments trouble since. although I want to blog on this some more I must say I am very impressed with every aspect of the phone, not excluding the call clarity, which is better than my land-line. There is one small wrinkle in the whole Moto G is AMAZING package and it will only affect a small number of people and that is side loading is not straight forward, more on that another day/year.